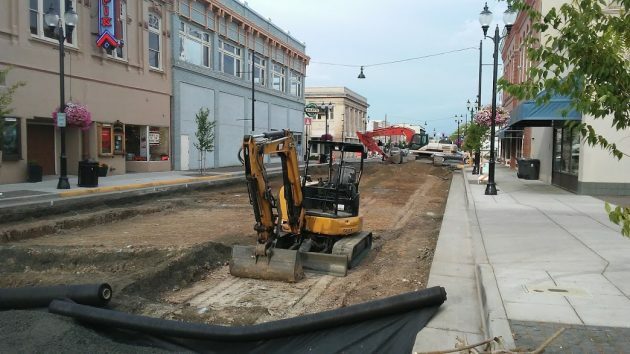 After hours on Wednesday: Reconstruction of Second Avenue downtown, one of the last parts of CARA’s streetscape project. Now that the downtown streetscape project is winding down, Albany’s urban renewal agency will have to decide what to do next. One potential idea: Put on a push to improve the neighborhood east of Lyon Street by rebuilding the streets and upgrading the houses that need it. On Wednesday, the advisory board of the Central Albany Revitalization Area got a refresher on what urban renewal agencies in Oregon are all about. Among other things, within urban renewal districts, they can spend money on any rehabilitation or conservation project. They can acquire real estate and clear areas they’ve acquired. They can install, construct or reconstruct streets. Albany’s urban renewal spending is limited to the maximum indebtedness set in the urban renewal plan in 2001: $56 million. Of that amount, $37.7 million was left to spend in June 2016. After the streetscape project, for which the city borrowed $8.4 million from the state, that leaves just under $30 million. Albany might look and see what Medford has just done. In March, Medford amended its urban renewal plan by allocating almost $18 million to the Liberty Park area described in the Mail Tribune as crime-ridden and poor. (“Nice park, crappy part of town,” someone commented online.) The Medford council, acting as the urban renewal agency as in Albany, said the money should be spent on street improvements, a program to replace sewer laterals, housing assistance, and other things. The part of the central Albany urban renewal district east of Lyon Street is overdue for some concentrated attention from CARA. There has been a modest program to encourage people to buy old houses in the Hackleman Historic District and restore them as single-family homes, but it fizzled. So a concentrated push, like the one in Medford to lift up the area around Liberty Park, would be in order for the area east of Lyon between the river and the Union Pacific main line. They might start by rebuilding the streets. That would give people with money the idea that if the city invests big money there, they should too. That’s not the only kind of thing CARA should do. Other possibilities? Buy some under-used property downtown and get somebody to build something interesting. How about a downtown hotel and parking structure to accommodate the throngs of carousel tourists we were told to expect? 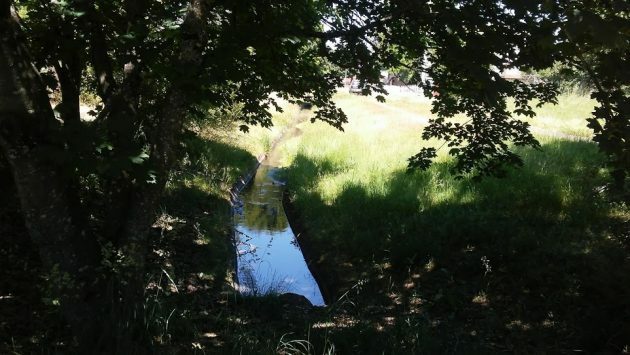 CARA’s east Albany program might include restoring the pitiful Thurston Street ditch as a regular canal. About those “throngs of carousel tourists” . . .
During recent Budget Committee discussions, I said much the same to Councilmembers. 17 years into the URD, we are barely halfway through its total indebtedness. The CARA board needs to get a sense of urgency and find a path towards wrapping up this agency. What??? And take away their ability to spend other peoples money for their pet projects? Although it would be nice to make improvements that will draw investors to the east of Lyon St, where will its low income residents live when they are driven out by rising rent and property taxes? I see the old Mark Thomas Car sales lot / building as a great place for a downtown brewery and restaurant. Why not pursue or encourage something like this? That property was purchased by Main Street Body shop. One point in last night presentation was the URD to purchase properties to help attain the right purpose like you propose. But even a suggestion of this strategy puts people up in arms. But I see so many comments on suggestions on what I location of available properties should be become. It’s the business owners who decide this not the local government of the URD. But it is the goal to spur investors to create a place people want to be. Just wrap it up and shut it down. They will never revatlize old downtown to be the hub no matter how many dollars they flush down the drain. Brewery’s and pubs are cool but they don’t pay the infrastructure bill. As for the carousel, I wonder how much the city has subsidized it and how much more this will drain from the coffers each year? And Tourists…..what a pipe dream. What would be really interesting and a little less passive aggressive, is to ask the Carousel for some information about the numbers of visitors they’ve had since opening. I am downtown quite often on the weekends and it seems to me that the Carousel is quite busy. However most of the businesses are closed and not really interested in capitalizing on the new attention downtown. Instead of throwing subtle digs at the project, both form Hasso and in the comments, let’s assume positive news or seek facts. Well I’ll admit I don’t have all the figures concerning the expense/return on the investment in the carousel. I’ll also admit that a month or so ago when our grand daughter was here visiting from Texas she/we had a great time there. But…… that was one visit. $20 dollars in ride tokens and about the same amount in a couple of souvenirs. I seriously doubt we’ll ever go back. Two reasons for that, we only have one grandchild and how many times do I want to watch carved animals going round in a circle. I would bet dollars to donuts that if the carousel was actually breaking even on it’s operational costs let along repaying loans involved in it’s creation; it’s backers (read CARA) would be holding monthly press conferences with Powerpoint presentations showing how successful it was financially. I might have missed it but I don’t remember any news stories like that. Mr. Salmons: You are correct: if Cara was rolling in clover, they would find a way to get the press to report it in the D-H. According to a DH article in December 2017, the Carousel saw more than 60,000 riders since opening in mid-August. 12,500 rides a month doesn’t seem like nothing. Assuming 22 working days a month, that’s more than 550 rides a day. Seems like it’s bringing plenty of people downtown. As a 10-year resident of Hackleman the area has changed drastically. Does it need more? Yes. Really the cup half empty approach probably gets you readers. I don’t see it the way you do. Also you can feel free to smile a little more. Setting aside the procedural objections of GS and TC, it seems that the original strategy didn’t have enough backing to be finished quickly. Add in an economic meltdown or 2. If you want rapid closure, the city needs two things : an executable plan that supports identified objectives; a thick-skinned project manager with no ties to local traditions who executes, takes a performance bonus, and moves on. Once again it doesn’t matter how much money is spent on revitalizing downtown until all of the building owners care about their building upkeep so that their tenants will stay. Having leased a downtown location for 4 years where the landlord did no repairs including saying he would replace the heating and air system so it would work. Instead we went the last 13 months of our lease with no heat or air.